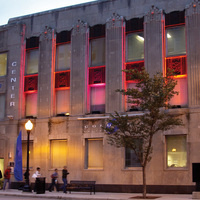 The Dance Center is 33,000-sq-ft, four-story art deco facility that includes: a 272-seat state-of-the-art performance space ideal for any dancer, six dance studios with sprung wood floors, wireless internet access, dressing rooms, and locker rooms with showers. The best tap show I have ever seen. the Venue is outstanding for these types of events. This was a wonderful series and I can't wait to see more of these and supporting our Afro-Latino communities! Full Disclosure: I am freelancer with EOI - Words on Water was an excellent program. Akbar's insight, clarity and charismatic presentation made nuanced and complex accessible to those at any level of historical understanding of partition and global issues. Likewise with Butalia and Lahiri, and all of our local hosts. Columbia College was a fantastic host and the Dance venue was perfect. I am pushing for next year's event to be digitally recorded and posted.